Note: not in any way a critical review, just my own rambling thoughts on analogues and subtext. The citizens of the titular city are preparing for an ice age, whilst thousands of immigrants clamour outside the walls, denied access. Politics and magic mix to see dark ambitions realised as the threat of war looms on the horizon from a nameless source. 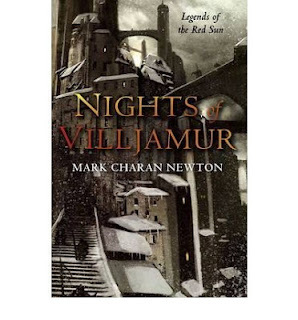 Nights of Villjamur (2009) has much more in common with the Viriconium stories of M. John Harrison than anything else I’d read. A lot of Fantasy is simply analogue of a medieval Europe. True, there’s a trend of more Eastern (and Middle Eastern) Fantasy novels coming through (check out The Oathbreakers Shadow by Amy McCulloch), but a quick look at the Game of Thrones television series will show you where a lot of traditional Fantasy resides. Nights of Villjamur doesn’t cling to any analogues. It’s proudly strange, somewhat chilly, brave enough to have giant trilobites rootling through garbage alongside stray dogs. Only the Banshees from Irish legend have imported wholesale – the exception that proves the rule in this case – and they are used to chilling effect near the novel’s climax. There’s also a refreshing lack of stable boys with heroic destinies. Instead we have the dutiful Commander with a shameful secret; an Inquisition Investigator rekindling his relationship with an estranged wife; the philandering rogue who’s loyalty is only to himself (at the novel’s beginning at least). All readily recognizable archetypes, all given a twist or imported from other genres altogether. Who would have imagined the veteran cop, separated from his wife because of his dedication to the job, would find his way into a Fantasy novel (and sporting a tail, no less)? 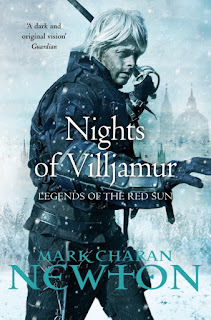 Make no mistake, Nights of Villjamur is challenging in its otherness, but rewards the reader with a satisfying ending. Go to any Science Fiction convention and attend a panel and there’s a good chance you’ll hear the old adage that ‘speculative fiction holds up a mirror to what is happening our world’. Reading Nights of Villjamur (2009) in 2013 I was repeatedly struck by how the harsh weather of Villjamur mirrored the frostiness of our economy, and how the immigrants and lower orders of society were being frozen out of day-to-day living. It’s not a subtle or nuanced interpretation, I grant you, but the nobles of Villjamur are content to shelter beneath their wealth and privilege as others face the prospect of starvation and exposure. That all sounds a little too close to home for my tastes. Okay, I *have* to read this.